Join the JOY Group for our incredible Wednesday morning Bible studies at 10 am or grab a calendar and see what fun events are coming up! Every Wednesday morning at 10 am, join us for traditional hymns, Bible Study, and a potluck lunch in the Hospitality Room! It is an amazing time in the Word and in fellowship! The JOY Group has monthly events and trips to build community and enjoy doing life together! 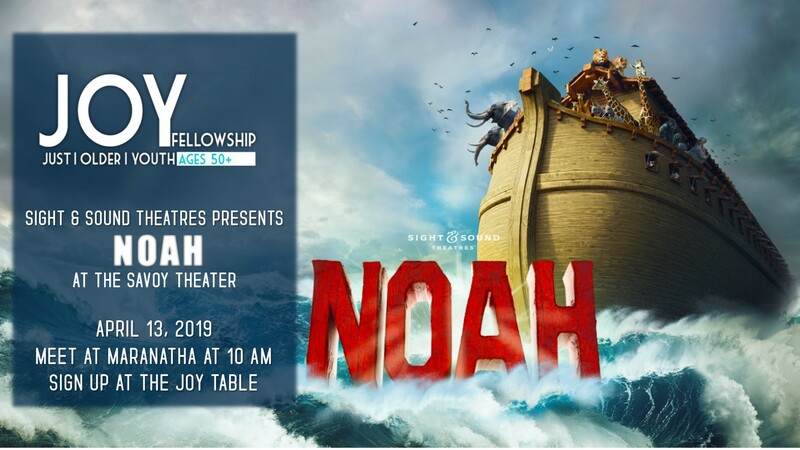 April 13th, we are headed to Savoy to enjoy the Sight and Sound’s production of Noah on the big screen! Meet at the church at 10 am and we will head out by shuttle to enjoy lunch and this amazing movie!